Ok, I'm not holding back on this book. It is utterly delicious! 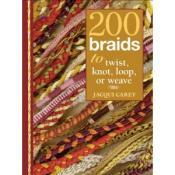 200 Braids, at over 250 pages, is a small (maybe 5" x 6"), hard back with spiral interior pages and every page is full color. While intended for braiding with yarns and threads, its use for wire braiding holds firm.